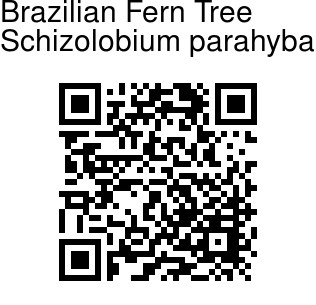 Brazilian Fern Tree is a deciduous tree with straight trunk, that can grow as fast as 10 ft per year, to reach up to 60-70 ft or more in natural habitat. It is native to the Atlantic forest of Brazil, also found in Costa Rica in regions. 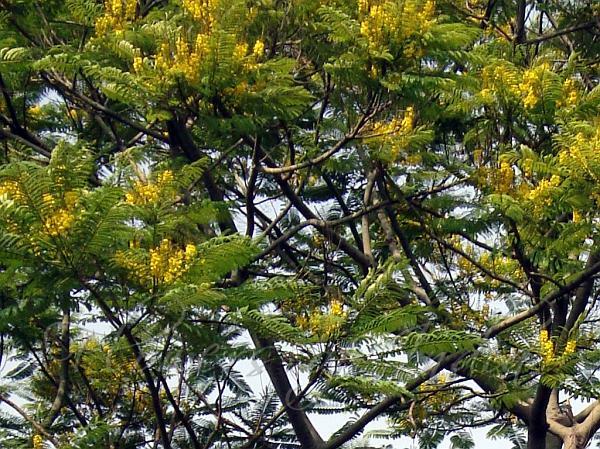 The tree has enormous double-compound leaves that sometimes exceed 6-7 ft in length. That sometimes mistakenly makes people confuse a young plant, with a fern or palm. Leaves grow up to 1 m long, leaflets opposite, elliptical, with stipules that fall over time, with 22-50 pairs of pinnae, leaflets 40-60 per pinna, 2-3 cm long by 7-10 mm wide. It briefly sheds its leaves before flowering. Yellow flowers are borne in hairy, dense spikes. The fruit is a legume, obovate, leathery, dark brown, 10-15 cm long, with a seed, elliptical, bright and very hard.